While many of us may have heard that we need to eat grains, we may not really understand what the “big deal” is when it comes to choosing the type or source of the grain. If you add to that the confusion around “gluten free,” “whole grain” or “multi-grain,” a simple, enjoyable, task may become overwhelming. Here we will discuss grains: what they are, what makes grains whole, what all the buzz is around gluten-free foods, the recommendations, and how to choose what is best for us. Back to Basics—What are grains? Grains are the edible seed portion of certain grassy plants such as wheat, rice, corn, barley and oats. These edible seeds are also known as “cereal grains.” These grains can be ground up into flour that is used to make foods that are categorized into the grains group on MyPlate. 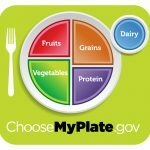 MyPlate is the icon developed by the United States Department of Agriculture to give Americans a visual of what a healthy plate looks like. MyPlate reminds us that our mealtime plates should consist of fruits, vegetables, grains, protein, and dairy (as best as we can). Grains are not only tasty; they are a source of energy, vitamins and minerals. Grains are also versatile, and can be served as part of all of our meals. Think: breakfast cereal, lunch sandwich, and rice as dinner a side dish. This food group is eaten throughout most of the world and is considered a staple food for many traditional meals. What about gluten and gluten free foods? The word gluten describes a set of proteins found in some grain foods. A small percentage of the population does not tolerate gluten or can have negative reactions if they consume it. For the majority of Americans, gluten does not cause issues and does not need to be avoided. Gluten is found in wheat, rye, barley and triticale, and foods made with these grains. The Dietary Guidelines for Americans recommend that we make sure half of the grains we eat in a day are whole grains. You may be wondering what exactly is a whole grain. Again, a grain is a seed. All seeds have a seed coat on the outside, and the seed germ and endosperm on the inside. A whole grain food is made with flour that contains all three parts of the grain (coat, germ, and endosperm). Whole grains are great because they have higher amounts of vitamins, minerals, and fiber than their refined counterparts. Refined grains are foods made with flour that contains only the endosperm. When the seed germ and coat are removed, the flavor, texture, and nutrition profile changes. Refined grains need to be “enriched” by adding vitamins and minerals back to the flour. Because of this, whole grains are a more complete source of nutrition: they have fiber to help us with digestion and prevention of certain diseases, and they have naturally occurring vitamins and minerals to keep us healthy. Making the healthy choice does not need to be complicated. In fact, a lot of times the healthy choice can be the easy choice! When looking at which grains to purchase, remember to make sure at least half of the grains you eat in a day (say, those you eat with breakfast and lunch) are whole grains. To identify foods that are made with whole grains, turn the package on its side or back and look for the first ingredient in the ingredients list. It should start with the word whole. For example, it may say whole wheat, whole oats, or whole corn. If the ingredients list starts with the word refined or enriched (for example: enriched wheat) this means the food is not a whole grain food. Don’t be confused with terms found on the front packaging like multigrain, honey wheat, sprouted grain, etc. Simply turn the package, look for the ingredients list, and look for the word whole before the first ingredient. Virgilia is a Registered Dietitian with a background in Public Health and Business Administration. Her professional focus areas include disease prevention, wellness promotion, food safety and food systems.